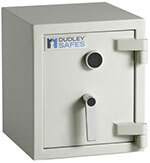 Ideal for both the home and business owner who require a high grade, but small security safe. The safe benefits from both a high grade locking mechanism as well as a 85mm overall thickness door. Fire tested to BS476 Part 20. Added fire protection is provided by a heat activated door seal. Bolt work is 4-way engaged (3-way moving with 28mm dia.bolts). Enhanced 50mm body construction with drill and fire resistance properties. 83mm overall door thickness. Bolt work is 4 - way engaged.